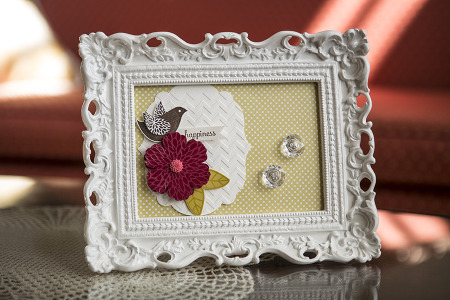 Casing Shelli - A Betsy's Blossom Frame. 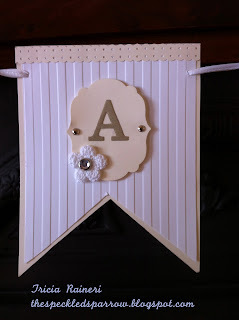 I have to say I have always loved Shelli's style when it comes to projects. Those of you wondering who I mean by Shelli have to understand that I mean Shelli Gardner - CEO and Co-founder of Stampin' Up! of course. There is no other Shelli! Seriously, how pretty is that? 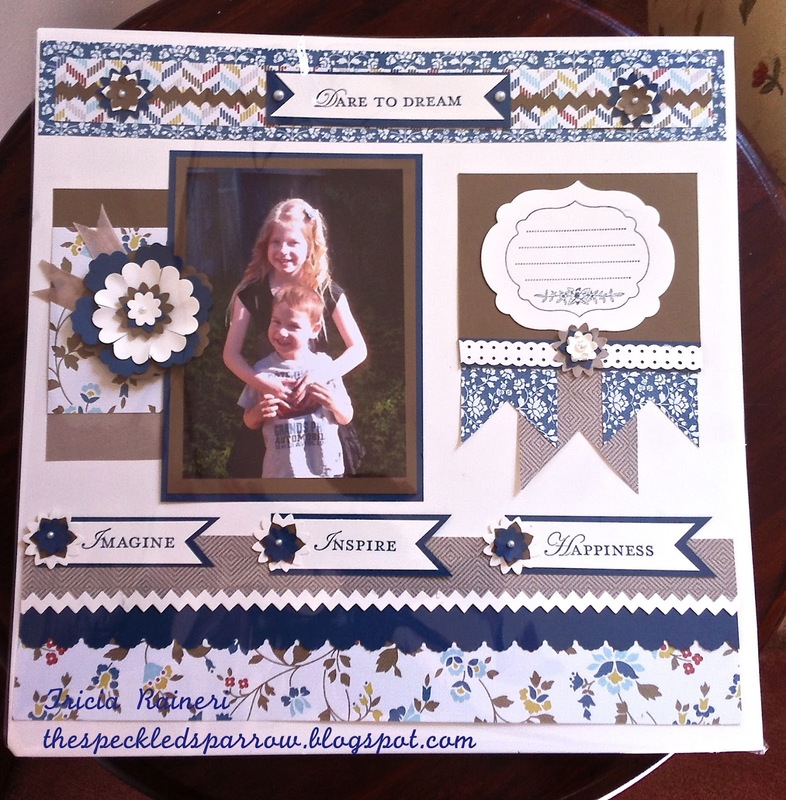 Here is the link to .....Shelli's Frame on her blog. I loved it and wanted to recreate it "my way" but as we as demonstrators here in Australia only had limited items we could preorder I could not get my hands on those amazing Vintage Faceted Designer buttons! Oh how I pine for some of those buttons & those cute Dahlias too come to think of it. I may or may not add the vintage Faceted Buttons when I finally get my hands on them but just in case I have left room for them. I used different DSP too & changed the colour of the bird to my fave In Colour - Midnight Muse. I am quite surprised by how much Summer Starfruit is growing on me too. When I first saw it I literally said "Ewwww!" but now I am beginning to come around to it's charms. I love it in this frame - both the leaves and DSP are Summer Starfruit. Cool Tools: Bigshot, Framelit Labels Collection, 1" Square punch, Blossom Punch, Itty Bitty Shapes Flower punch, Paper snips, Dimensionals & Brights 4.8mm brads(Daffodil Delight), Heat Gun, Clear Embossing Powder, Paper Piercer & Petals a Plenty Embossing Folder. The time has come to say goodbye to a few of my old stamp sets friends. Many, many products are retiring but I am REALLY sad to see Welcome Christmas going. It was one of my go to stamp sets for Christmas and is so versatile. I recently ran a retiring product class and here is what we made. I loved this Christmas Cocoa DSP and have not used it much, so figured it was a good time to finish off that pack. These cards are based on a Stamping Moments class. You can view it HERE. The gift card holder opens when you remove the sleeve, but I forgot to take a photo of the inside- sorry(it isn't very exciting anyhow). I have punched out a section with a word window punch to hold the gift card. If you would like to purchase this stamp set it was still available as of this morning. Please contact me ASAP as last orders need to be in by 31st August. There are only 2 days left to get your hands on the retiring products! And the good news is Lovely As A Tree now comes in clear mount as of September 1st. Paper: Real Red, Whisper White, Soft Suede, Christmas Cocoa DSP. Ink: Real Red, Crumb Cake, Soft Suede. Stamp sets: Welcome Christmas, Lovely As A Tree, Contempo Christmas ( also retiring). Cool Tools: Word Window punch, Score Tool, Paper snips, Sticky Strip. Well, well...what do we have here??? Another scrapbook page - I know a miracle has occured! I received my pre-order for the new 2012 Catalogue just the other day and like a kid in a candy shop I just did not know where to start. Then I set my eyes upon this gorgeous DSP called Comfort Cafe. It coordinates with a lot of my favourite colours including Soft Suede, Very Vanilla & my new best friend the 2012-2013 In Colour - Midnight Muse. As our alphabet die is retiring this month I was stumped as to what to do about a heading (I like a good heading don't you)? I then remembered I had the Loving Thoughts stamp set from the Autumn - Winter Mini, which I am glad to say is carrying over into the new catalogue. It is safe to say there is a lot of big shot action here. While, once again it is a little light on stamping, I have added more on this than my last page! I really do have trouble with stamping on scrapbook pages. My two little cherubs feature on this page and taking this photo was no mean feat for me. They just don't stand still long enough in the one place to get a photo of them together (looking at the camera) like this EVER! I haven't added my journalling yet but you can see I made a little journalling box out of the Framelit Labels Collection and the Apothecary Art stamp set. Paper: Very Vanilla 12 x12, Midnight Muse, Soft Suede, Crumb Cake, Comfort Cafe DSP. 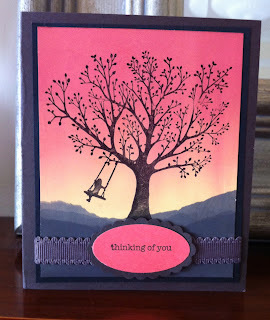 Stamp sets: Loving Thoughts, Apothecary Art. Cool Tools: Bigshot, Framelit Labels Collection, Bigz XL Tasteful Trim Die, Adorning Accents Edgelits, 1" Square punch, Boho Blossom Punch, Blossom Punch, 1 3/4 Scallop Circle punch, Dotted Scallop Ribbon Border Punch, Pearls. Ribbon: Crumb Cake Seam Binding Ribbon. I have been busy this last fortnight getting ready for Paperific 2012. This event is a paper crafters heaven with all things paper, scrapbooking, stamping and now......fabric! 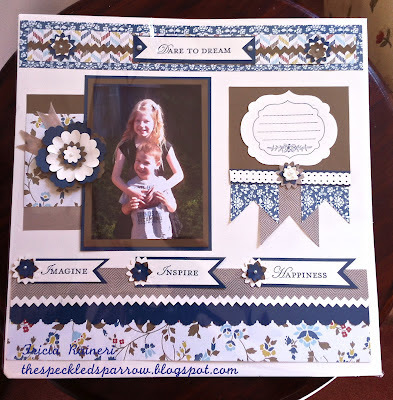 Paperific (click here to go to the Paperific website) is on August 31st - September 2nd, 2012. 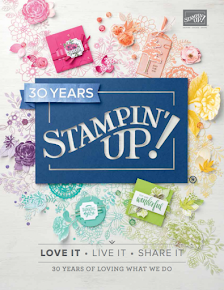 I am working at the Stampin' Up! stall on Friday and Sunday so if you come along - please do stop by and say hello! Smoochy & Twitter are my two fabric Owls I have been working on for the last two weeks. My mother has kindly helped me with the finer details of sewing them - I really am terrible at sewing so her help was very much appreciated. Smoochy on the left is made from Summer Smooches fabric (available Sept 1st) and Twitter is made from the Twitterpated fabric. The Circle #2 originals die also came in handy for the eyes. I decided to add some soft toy eyes as they looked better with this addition but they could be left just with plain felt eyes. Fabric: Summer Smooches 125411, Twitterpated 125412, brown, white & black felt. Cool Tools: Big shot, Circles #2 die, Crystal (safety) toy eyes 15mm, Hobby Fill (stuffing). There are only 12 days to get yourself the retiring items. Once they are gone....they are gone forever! Here is the updated SOLD OUT items as of today - Sunday 19th August. 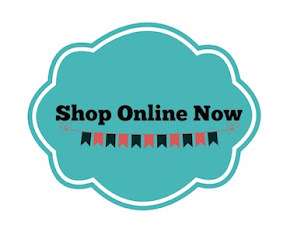 If you would like to order anything - please contact me ASAP on 0411113530 as many items are selling fast. I have to admit I have not really had much to do with the brayer, until last week. I have seen lots of people using it in many different ways but I just never found the time to pick my own one up and use it. This week I have been going brayer crazy! I thought we would use it as a technique for stamp club so I dug it out and went in search of ways to use it. To make this card I used Pool Party, Island Indigo then Not Quite Navy. I masked off a moon using a 1 1/4" circle punch and also masked off the ground area so it appeared snowy. I used glossy white card and stamped the trees in Stazon Black ink. I used a white gel pen to create snow. 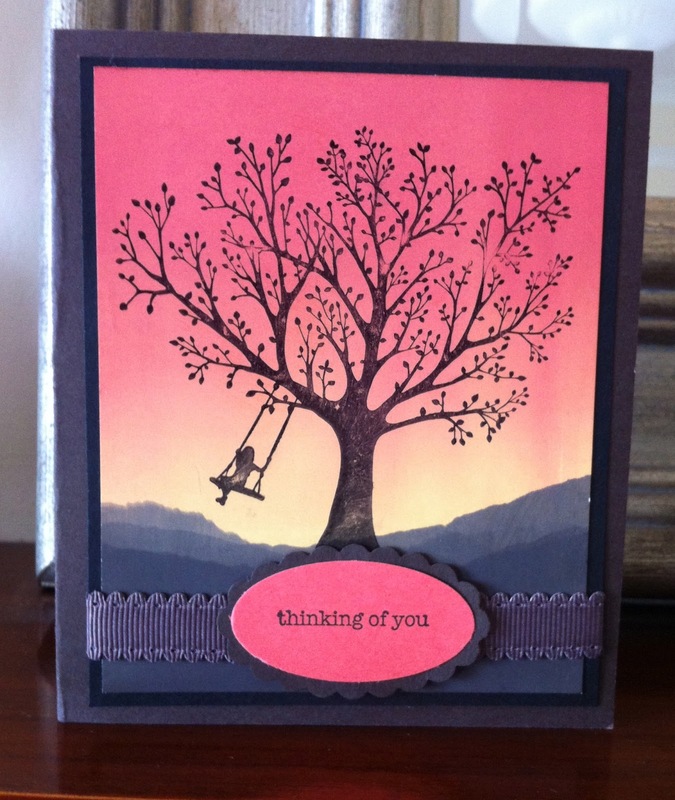 For this card I stamped the tree in Stazon Black ink,then masked off the bottom and used Daffodil Delight, Cajun Craze and Real Red. Once this was done I masked the top and brayered Early Espresso a few times to the base of the card. It turned out a Calypso Coral type colour so I stamped my sentiment onto Calypso Coral We all agreed this would look nice using some palm trees or african style trees. Some of the ladies put a sun in the background however I left mine plain. Paper: Glossy White Cardstock, Calypso Coral, Basic Black, Baja Breeze, Early Espresso. Ribbon: Chocolate Chip Scallop Dots Ribbon (turned over) & White Organza Ribbon. At the Stampin' Up! 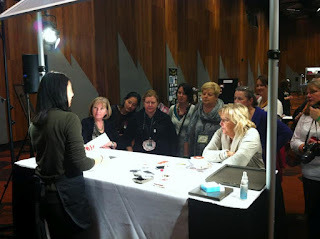 Convention in May this year I saw Beth Stewart demonstrating the elegant bird die. Whilst I have an addiction to bird style paraphernalia, I was not overly impressed by this die when I saw it in the catalogue. To my surprise, after seeing Beth demoing its many uses, it grew on me and I am somewhat addicted to using this die now! I loved her Peace banner she made. You can see Beth's version HERE. I loved it so much I decided I would recreate it using what I had in the way of supplies - it is pretty close to the original though. Here is my version - it is quite long so hard to photograph! It used lots of supplies but was well worth it. 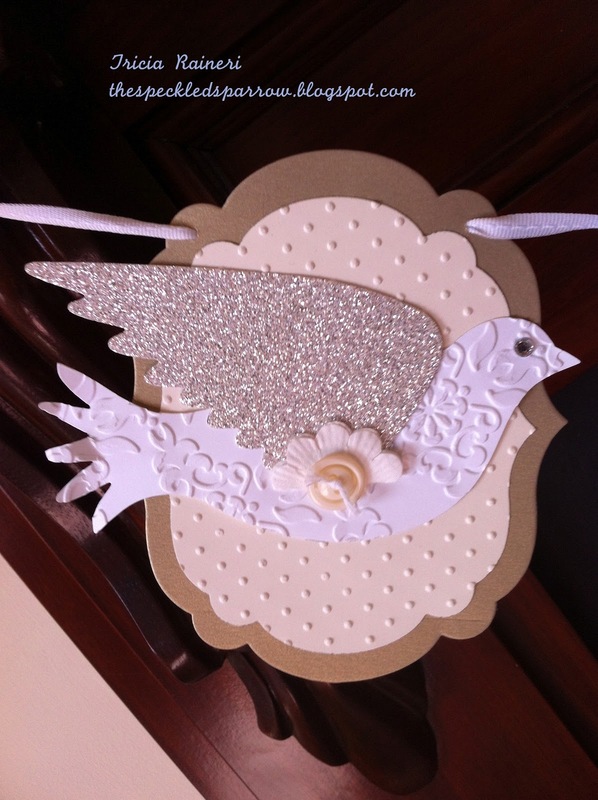 Paper: Very Vanilla, Whisper White, Silver Glimmer Paper, Brushed Gold A4 card stock, First Edition Specialty DSP. Ink: Peach Parfait & Early Espresso (to colour the glimmer paper for angel hair) and for cheeks, Basic Black Marker (eyes). Cool Tools: Big Shot, Perfect Polka Dots Embossing Folder, Vintage Wallpaper Embossing Folder, Stripes Embossing Folder, Framelits Die - Labels Collection, Elegant Bird Bigz Die, Timeless Type Junior Alphabet Sizzlit Die, Paper Snips, Scallop Edge Border Punch, Neutral Buttons, Paper Daisies, Fleurettes II, Rhinestones, Silver Brads, Rhinestone Brads, Dotted Scallop Ribbon Border Punch, Pearls, Dimensionals, 1 1/16" hole punch. Ribbon: Whisper White Bakers Twine, Whisper White 1/4" Stitched Grosgrain Ribbon, Very Vanille Seam Binding Ribbon. On Saturday 4th August, I attended the Stampin’ Up! Heartfelt Event held at the Melbourne Convention Centre. It was such a fantastic day! I got to not only meet up with my fellow Stampin’ Up! Demos, but also got to share the experience with my friends & customers. It was a relaxed, "choose your own experience" type of event that allowed everyone to try some of the amazing Stampin' Up! Tools & new products coming out in the 2012-2013 catalogue and brand new Holiday Mini. There were mirrored demo booths where you could watch skilled Demos showing you workshop ideas, flower making and 3D items. Mirrored Demo Booth in action! Tables were set up with tools to try and stamps and ink pads to stamp with. The air was scented with spice and peppermint embossing powders being tested. Everywhere you turned there was something interesting going on! There were display boards where all attendees could display a project they had made and also displays by other demos. Display board of share projects made by attendees - oh mine is here can you guess which one is mine? There were tables set up to create your 4 make and takes with your free stamp set and to enjoy your lunch that was all provided. On top of all this there were structured sessions in a separate area where you could watch some fantastic presentations on gift wrapping by Simone Bartrum & heartfelt cards with Janine Rawlins. We also got to see some great Holiday decorating ideas by the talented SU staff member Sophie Zadeh and Pam Jorgensen inspired us with her gift giving ideas. 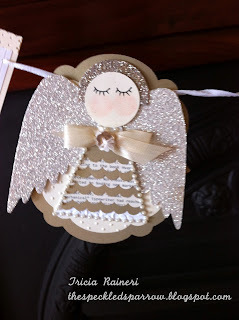 We all got to make a Christmas decoration with a new stamp set and matching framelit and a special new ink pad. We then got to write a special message to SU and hang it on the Christmas tree on display and take a special gift from under the tree! 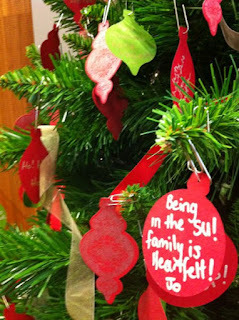 Thanks SU for all that you did to provide an inspirational creative day. I had such a wonderful time and loved every minute of it. Next stop for the show is Perth on August 25th. 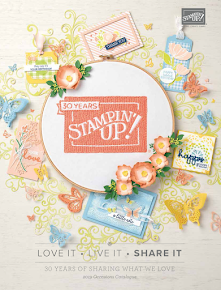 See the Stampin' Up! Website for information & dates in your city! On the Accessory list you will see all the stamp pads - that is because SU are upgrading their stamp pads to the new foam pads. So, all the old style ink pads are going to make way for this renovation. As you know, the 2010-2012 In Colors will retire at the end of the month. It’s hard to believe that it’s already time to say goodbye to Blushing Bride, Concord Crush, Peach Parfait, Pear Pizzazz and Poppy Parade! We announced in 2010 during the last colour renovation that we plan to refresh the Stampin’ Up! colour collections every three to five years. With that in mind, you may want to hold onto your 2010-2012 In Colors supplies in case we add them to a colour collection in the future. Don't be too sad about all these things going because there are so many new and exciting products coming our way! Cardstock: Blushing Bride A4, Confetti White A4.